Tom's repeated quip 'Just remind me, why do we do this ?' 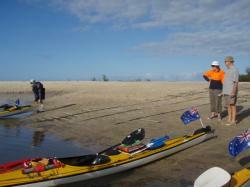 might be turned around and question why more people do not paddle. Finishing the week shoe horned into a caravan park over a long weekend makes me selfishly grateful for the low profile of the sport. 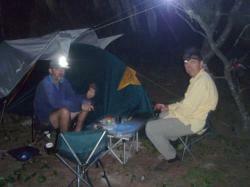 Without it our beach camp and moonlight swims may have not been so secluded. 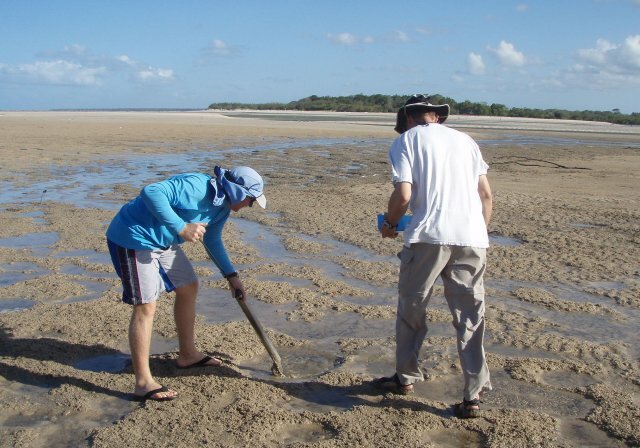 The idea for the first part of the week was to make the most of the king tides and explore the creeks of the Kinkuna Section of the Burrum National Park. 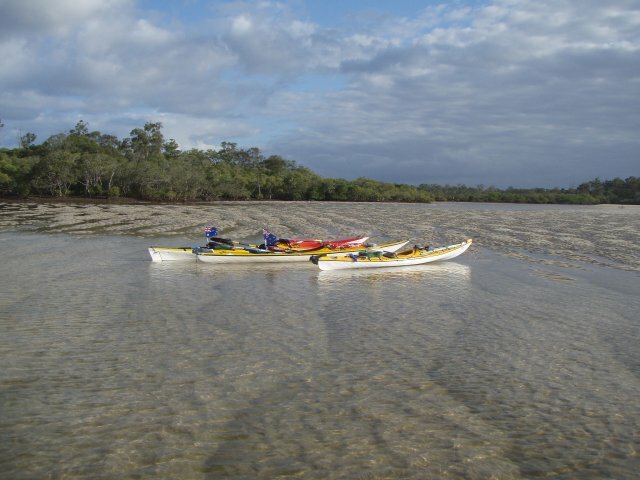 After a two nights we would paddle south to Burrum Heads on the incoming tide to join forces with the Brisbane Bushwalkers. 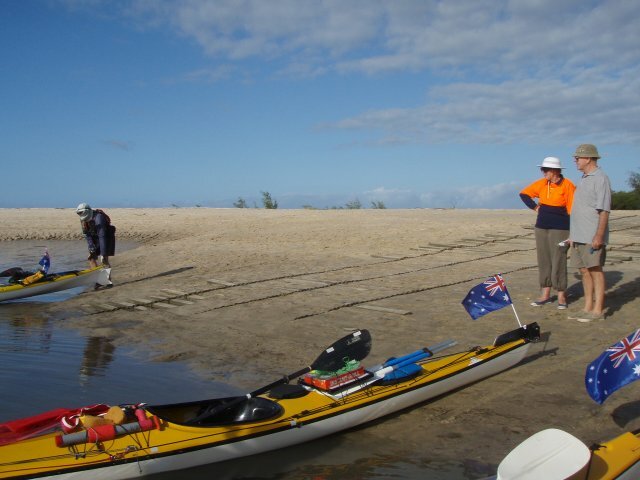 They were here to have a look at the area and get some more experience in kayaks before paddling the Able Tasman National Park. Temporary retirement might have been starting to have a wayward influence on Tom. Instead of meeting at the Caboolture BP Service Station, the phone rang on the dot of 9:30 with an order for a flat white. However Tom clearly needs more practice at doing 'a Brian' as he just pre-empted the three coffees on the counter. Strung out on a caffeine hit we headed north with another pit stop outside of Gympie having missed the turn off to Tin Can Bay. Taking the short cut to Woodgate the UHF commanded the next stop be Mamminos so Tom could find out whether the icecream really was a world beater. Out the back under the patio we had our packed lunch and icecream (not necessarily in that order) whilst a rain squall passed. On the way up we had been unable to find a lemon to go with the lime bought at the Howard Service Station for the promised fish, so next stop was the Hollow Log. Here a long chat was had, a few freckles collected in the sun before leaving with the gift of some early Meyer lemons. Driving into Woodgate the white caps out front indicated a firm blow. The wind was forecast to hold up around 25Kn and a recce to Theodolite Creek had it shaping up as the chosen camping spot. Back to Mark's Mum's for afternoon tea where the gold fish were sized up as catch of the day. 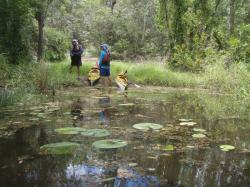 Having been plied with yet more scrummy nutritional supplements we all piled in and headed down to the creek. 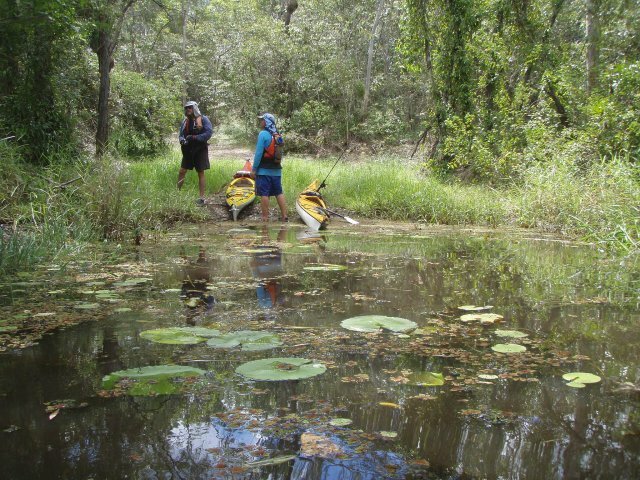 With the kayaks packed Ann and John took the cars back and we headed up the creek in search of yabbies to tempt the promised fish. Well, tempt if there had been any yabbies pumped. 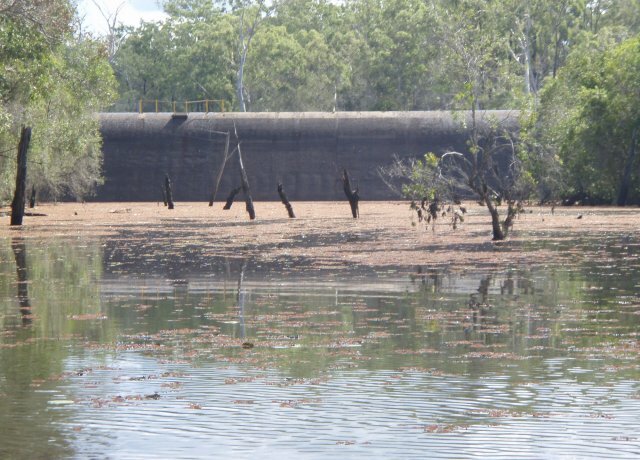 The sheltered area behind the dunes under the casuarinas on the northern bank of Theodolite Creek was deserted as it was last time. Not much had changed, including the pile of rubbish with chair remnants. There were a few more considerate collections of bottles. Our saving grace from 4WD yobs might prove to be the king tides in the middle of the day as these could render One Mile Creek an unattractive crossing. We pitched tent as the sun set and then waited. Waited for the moon. Full and rising around 7:30 it was an invitation for a gorgeous silver swim, something we enjoyed the following night as well. 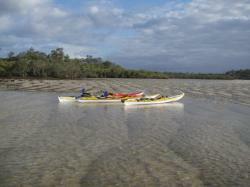 Ann paddled across the following morning to check out the camp site. She delivered some fresh homemade biscuits, rum and apricot balls for morning tea. After escorting her back we took the flooding tide up Theodolite Creek. Sailing and paddling it was an easy wander brought to a conclusion by a tree across the creek. 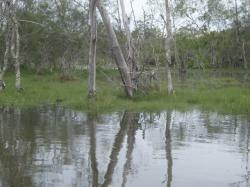 Whilst the highest tide had been the day before, the volume was still impressive and flooded grassy areas. 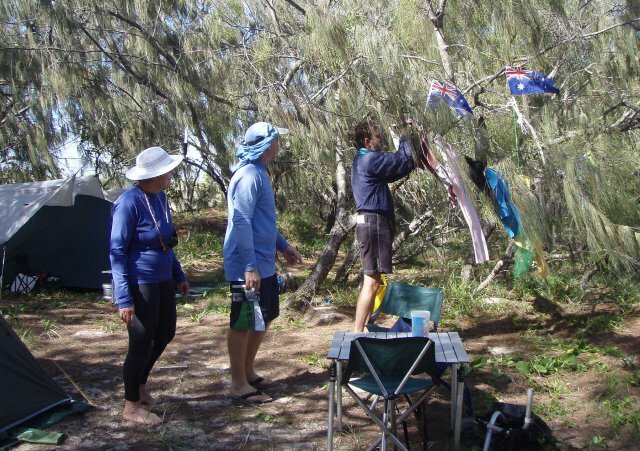 We munched on our morning tea and waited for the tide to slow and turn before heading back with Tom trailing his worldwide fish adverse lure. It came to an ignominious end when he went bush amongst the mangroves. Arriving at the camp site around mid tide with the wind still blowing and the bay choppy with small surf. We went for a walk in the direction of One Mile Creek on the 4WD track shadowing the foreshore. 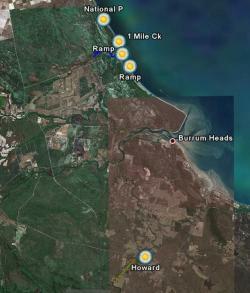 There are plenty of beaut places to camp with One Mile Creek turning out as good, if not better that what was eluded to on Google Earth. A triad of pelicans stood in the mouth for a spot of casual fishing. 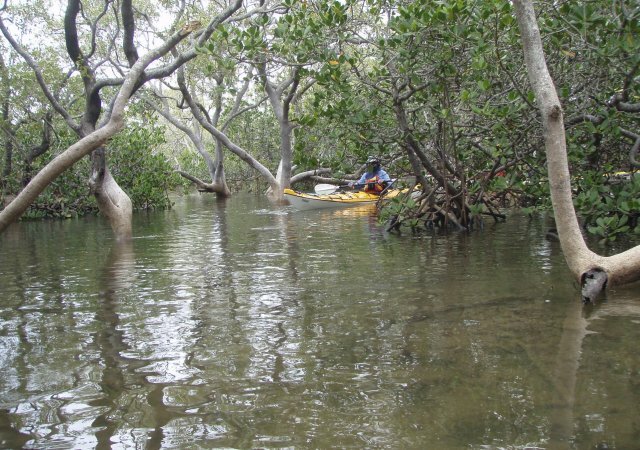 If you arrive at the mouth of the creek on the top of the tide you can paddle in. 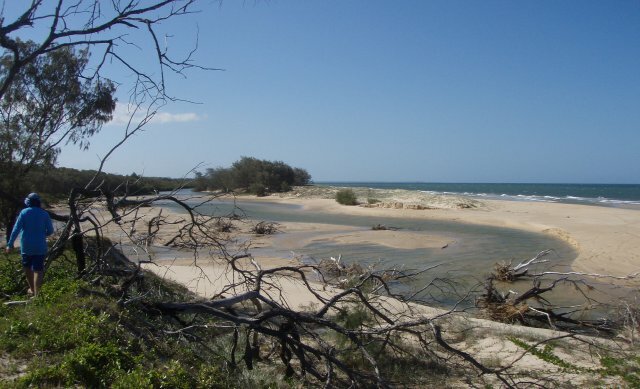 The creek is sheltered from the ocean by sand dunes covered in casuarinas. These dunes get wider the further north you travel so you could paddle as far as needed to shelter from the prevailing wind. 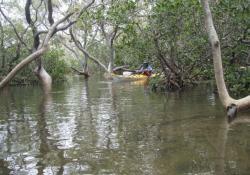 You would then have a creek and ocean side paddle option. We walked back along the beach as the tide continued to recede exposing the vast sand banks characteristic of this section of coastline. More success with yabbies out the front of the campsite although they appeared to be offerings to the Toad God and did not bring in the promised fish. Ann paddled across in the morning to catch the tail end of the gear pack and bring another batch biscuits for morning tea. 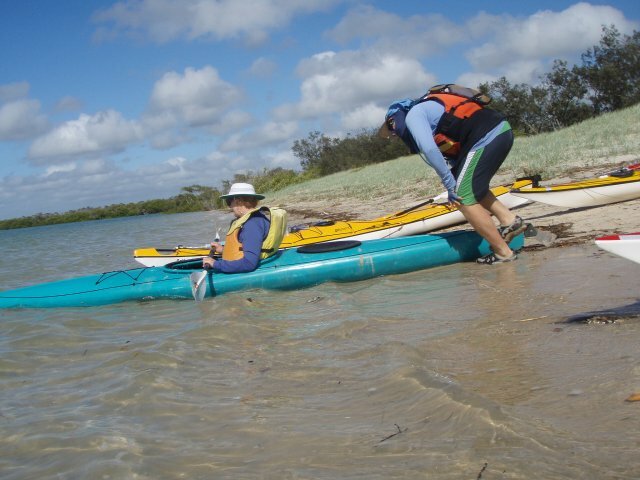 After seeing her back to the Theodolite Creek boat ramp it was decided to head out the front and paddle down to the boat ramp on the beach. While it was windy, the paddle to Burrum Heads would have been 'do-able' although somewhat trying. Coming in for a small surf landing was captured on home video. I looked like I had sat on a bee given the speed with which I leapt out of the cockpit after landing. Two boats needed a pump out (not mine). 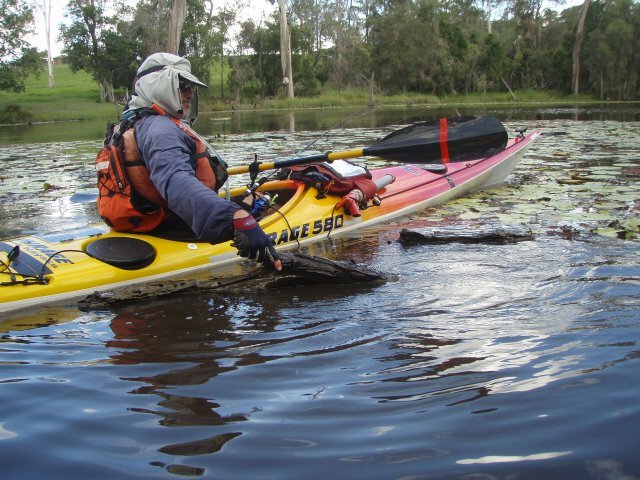 The expectant lemon and lime had us head for a tackle store in Childers for a small rod, a couple of lures then onto the upper (freshwater) section of the Burrum River for a quiet paddle, a flick of a lure and tips on how to catch a bass. 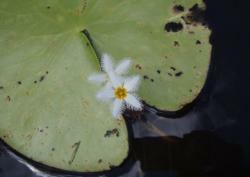 The lilies continue to line the banks and make a reliable catch, although haul of the day was Tom's 80lb log. The lilies have become very thick and now clog the waterway beneath the dam making it a difficult and sludgy paddle to get anywhere near the wall. As we were about to take a plunge and cool off in the murky freshwater the place was invaded by a station wagon of small children. With the mossies moving in we thought better of it and made out way to the Hillcrest Caravan Park to stake our place for the next four nights.